Over a thousand of entries all over the country were received by Jollibee but only five was chosen to be given the award being the exemplary Pinoy families for the Jollibee Family Values Awards held at the Ballroom C,D,E of Crowne Plaza Hotel, Ortigas on September 28, 2011. 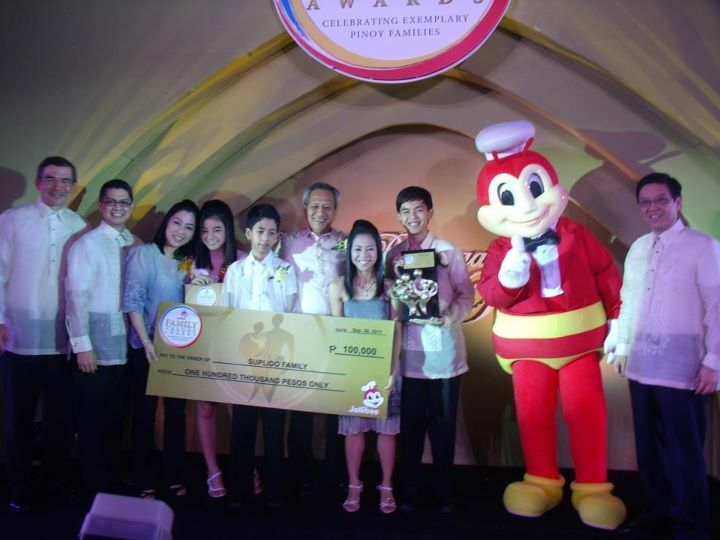 This was first announced last June and this is the first time that Jollibee will have this awards. 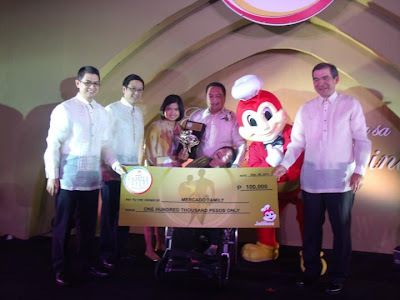 This was culminated the two month-long nationwide search and was attended by Jollibee's top executives led by Jollibee Global president Ernesto Tanmantiong and Jollibee Philippines' Jose Minana. 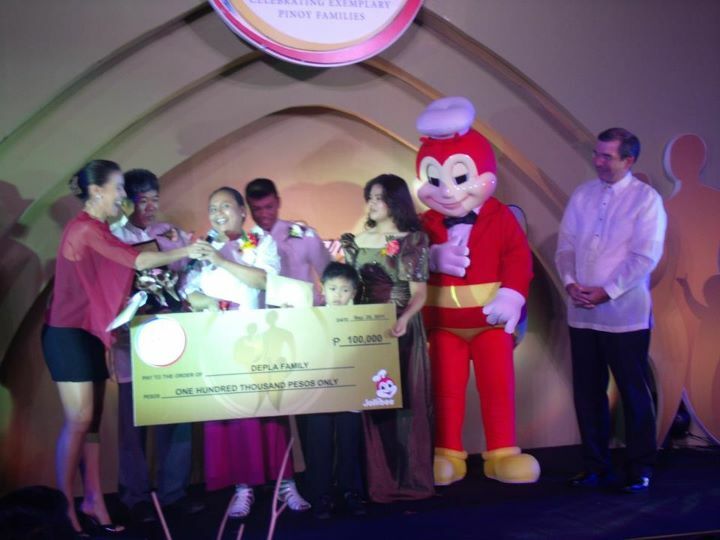 This awards recognizes the values that these families influenced the Filipino communities. This is indeed a very special and very memorable night for all especially to the five chosen families. 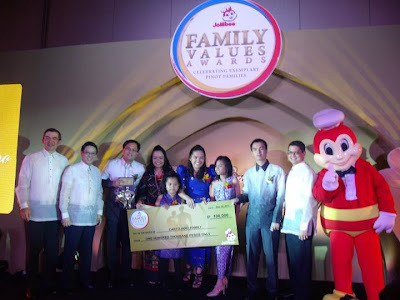 These five exemplary Filipino families possesses positive Filipino values - honesty, integrity, respect, unity, generosity, and of course love to one another. Flor Depla is a midwife who volunteers her services for free for expectant mothers who cannot afford to have their babies delivered in the hospital. She also conducts pre-natal seminars to help would-be mothers in their community. In addition, Flor acts as a guarantor for women in her barangay who wants to put up their small businesses. Her strong commitment to be of service to others has inspired all the other members of the Depla household to also do their share and reach out to other people in their community. All family members are active in the different projects of their Barangay, such as volunteering to help during medical missions, and clean-up drives among others. The Mercado family’s story is a testament not just of a husband’s unconditional love for his wife but also of the whole family’s resolve to rise above adversity. t. In 1986, Mila Mercado suffered brain damage while giving birth, leaving her paralyzed and unable to speak. But with the family’s strong faith and love for one another, they were able to accept this challenge from God wholeheartedly and instead opted to become sources of inspiration and hope for other people. school, Multiple Intelligence, they were able to launch and sustain the Cambantoc Reforestation project/. The family is also involved in advocating the implementation of the accessibility law in the Philippines. 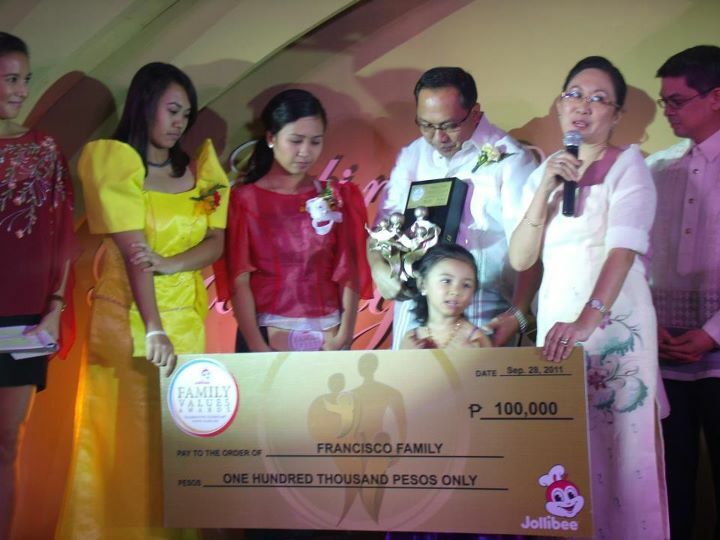 The Francisco family strongly believes in the saying that to whom much is given, much is expected. Blessed with a modest home, flourishing careers and three bright and wonderful children, Mr. and Mrs. Edonis and Christine Francisco have imparted to their children early on the value of sharing and reaching out to others in order to have more meaningful lives. The whole family looks forward to the several outreach programs they spearhead in their hometown of Lucena City as one of their favorite bonding activities. The Francisco family started a feeding program for public school children in Gumaca, Quezon in 2009, which has grown to cover 43 sites in Lucena City. They conduct this program every 6 months, 3x a week and even go the extra effort to monitor the growth of the children that have benefitted from their feeding programs). The family also organizes medical missions and helps children with cleft palate in their surgery. The Suplido family from Silay City strives to constantly nurture their deep faith in the Almighty while fostering love and peace not only in their home but also in their community. They support each other’s activities and take great pride in each other’s achievements. The love and support they share with one another extend beyond the corners of their home as as they aim to serve and willingly give a part of themselves to others. Ernesto and Mardi facilitate and give talks to couples for the Christian Family Movement’s Discovery Weekend and Marriage Encounter. They also started a regular summer workshop called “Kids for Peace”, where all of their children speak and participate, and are also regular facilitators of the 7 Habits for Highly Effective Teens workshops. The Cartojano family are all active members of the Red Cross. Rey is a board member of the Gensan Red Cross chapter and assists in the legal and policy making of the organization. Maya was an active member of the Quezon City Red Cross and helped during rallies, disasters and national conventions. Meanwhile, Rey Jr and Thea are trained first-aiders and volunteers during disasters, bloodletting and other community service events. The family also launched several websites and blogs to help promote General Santos, its many events and attractions as well as info and technology to the rest of the world (gensanexchange.com, philippinelawblog.com, skeptronsolutions.com, yamangensan.ph, etc). Thanks to Orange Magazine TV for the pictures. hanep talaga ang Jollibee.....the best..